1875 Coney Island, New York Looff First carousel and amusement ride at Coney Island. Installed at Mrs. Lucy Vanderveer's Bathing Pavilion in 1876. The nation's oldest platform carousel has been designated by the U.S. Department of the Interior as a national landmark. Constructed in 1876 by Charles Dare, it is one of only two Dare carousels still in existence. Originally operated at a Coney Island, NY amusement park, it was moved to Oak Bluffs in 1884, where it has lived in its red barn, delighting generations of Island residents and visitors ever since. The carousel was acquired by the Martha's Vineyard Preservation Trust in 1986 to prevent it from being dismantled and sold piecemeal to collectors of antique carved horses. Built in 1876 and listed as a National Historic Landmark. It is one of two Charles Dare carousels in existence. 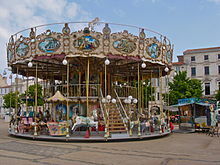 It is considered the oldest of its type "in which the horses are suspended from a center frame," as opposed to being mounted on a wooden platform, which causes the horses to "fly" as the carousel gains speed. 1885 La Ronde, Montreal The oldest galloping carousel in the world. Built in 1885 in Bressoux by Belgian craftsmen, it stayed there until 1964 when it moved to New York for their World's Fair. For Expo 67 it came to Montreal as part of the rides featured in La Ronde. In 2003, the Carousel underwent a meticulous restoration under the current park ownership, Six Flags. More than $1 million was spent to refurbish the ride, which reopened in a new specially landscaped garden in 2007.
c.1890s Tumbalong Park, Darling Harbour, Sydney A New South Wales Heritage listed attraction. It is an example of an old Edwardian Carousel which are very rare nowadays. It is operated by a classic steam engine which has been retained. The Carousel dates back to the 'Golden Age' of Carousels between the 1890s to the 1920s. First imported to Australia in 1894. Still operates in its original location. The 61 horses, one camel, and four chariots have been restored and the ride renovated. Charles I. D. Looff used this carousel as a showpiece for prospective customers. This is one of the few carousels that feature a ring-arm with steel rings and a brass ring. The original A. Ruth & Sohn organ still plays music for the patrons. 1900 Pullen Park, Raleigh, North Carolina Dentzel 52 wooden animals carved by Salvatore Cernigliaro. Added to National Register of Historic Places in 1976. 1903 Woodhaven section of the New York City borough of Queens Muller Brothers One of only two surviving Muller brothers carousels, it was listed on the National Register of Historic Places in 2004. 1905 Historic Lakeside Park in Port Dalhousie, Ontario, Canada Looff Brought to St. Catharines in 1921. It continues to provide amusement for young and old alike, at just 5 cents a ride. Sent to Seattle after the 1906 earthquake and returned to serve at Playland-at-the-Beach until that park's demise in 1972. 1907 Centreville Amusement Park, Toronto Islands, Toronto, Ontario, Canada Dentzel Carousel Company Acquired from Bushkill Park in Easton, Pennsylvania in 1966. Although it was sold to Carmel, Indiana in mid-2017, the deal was not approved by Carmel city council and the carousel currently remains in Toronto. 1908 Heritage Museums and Gardens in Sandwich, Massachusetts Looff Electrically powered. Originally built for a park in Meridian, Mississippi; acquired by Josiah K. Lilly III in 1968 and reassembled at Heritage Museums & Gardens in 1972. Originally installed at the Natatorium Park in Spokane. Initially shipped to Los Angeles and arrived in the San Diego area in 1915. In Balboa Park since 1922. One of the few carousels still in its original location for more than 100 years. It is a "pure carousel" meaning all of the horses were provided by the same company that built the carousel. It is also one of the few with the rare combination of a working ring dispenser and outside row jumping horses. The carousel features three band organs including a rare Ruth & Sohn 96-key organ with 342 pipes. The Looff carousel was designated a national historic landmark in 1987. Built in 1911 by the Herschell-Spillman Company and is one of the few carousels from its day still in operation. In 1976 it was listed on the National Register of Historic Places. 1912 Hollycombe Steam Collection (traveling) Tidman of Norwich A working steam driven Merry-Go-Round with 3-abreast Steam Gallopers. It has 24 horses, six cockerels and two chariots (for those who don't relish the galloping motion). It is driven by a steam centre engine, also Tidman, and has revolving pillars, which are believed to be the only ones still operating. Musical accompaniment is driven by a slotted card Tidman organ engine. 1912 Cradle of Aviation Museum, Garden City, New York Stein and Goldstein Artistic Carousel Co. Operated at Nunley's Amusement Park, Baldwin, N.Y. until that park's closure in 1995. Subsequently, purchased by Nassau County and placed in storage. It was fully restored and opened in 2009 at the Cradle of Aviation Museum in Garden City, N.Y.
1914 Como Park, Saint Paul, Minnesota A mainstay at the Minnesota State Fair from 1914 to 1988 when it was saved from the auction block by a non-profit group organized to save the landmark. The carousel is now located in Como Park in Saint Paul, Minnesota. 1916 Santa Monica Pier, Santa Monica, California Philadelphia Toboggan Company Housed a carousel by Looff until it was sold in 1939. It was replaced by Philadelphia Toboggan Company Carousel #62, which was moved from the Ocean Park Pier. Since 1977, the carousel has been owned by the city. The building remains a rare example of structures that used to be on the amusement pier. It was restored from 1977 through 1981. It was declared a National Historic Landmark in 1987. 1916 Herschell Carrousel Factory Museum, North Tonawanda, NY Herschell-Spillman Features two working carousels: The largest is a 1916 model that is 40 feet (12.2 m) in diameter, with 36 hand-carved horses and over 580 lights. The second is a small aluminum carousel specifically designed for children. The museum is located in the building complex which housed the Allan Herschell Company and is the only museum in the world housed inside an authentic carousel factory. 1926 Kennywood Park, West Mifflin, Pennsylvania Dentzel A National Historic Landmark. The music on this carousel is provided by a 1916 Wurlitzer Style #153 Military Band Organ and over 1500 lights decorate this ride. The carousel features 50 jumping and 14 stationary horses, a magnificent lion and tiger, and Dentzel's signature Jesters and Cherubs. 1928 Canada's Wonderland in Toronto, Ontario Philadelphia Toboggan Company Originally located in Palisades Park, New Jersey the carousel was also used at Happyland Park or Hastings Park, Vancouver, British Columbia, and Palace Playland, Old Orchard Beach, Maine, before it was purchased by Taft Broadcasting in the 1970s and put into storage. It opened in its current location in 1981. 1929 Heritage State Park in Holyoke, MA Philadelphia Toboggan Company Originally assembled at the now shuttered Mountain Park. The carousel was reassembled and preserved (in full operation) at Heritage State Park with the help of John Hickey and the Holyoke Water Power Company in 1993.